Shrewsbury – George J. Kalil, 83, a longtime resident of Shrewsbury, died peacefully Thursday, May 5, 2015 in the Christopher House, surrounded by his loving family. George is survived by his devoted wife of 48 years, Ann (Swirnialis) Kalil; his son, James Kalil; a brother, Edward Kalil and his wife Ruth; and nephews and nieces. He was predeceased by his sister, Helen (Defeo) Dangelo. George was born June 18, 1932, son of the late James and Victoria (Shakour) Kalil, and lived in Worcester before moving to Shrewsbury. George was a graduate of North High School and the Boston Radio School, and worked at the former Johnson Television Company for several years as a repair technician. In 1952, he joined the United States Army and graduated from Signal School at Camp Gordon in Georgia, and then served his country proudly during the Korean War. Upon returning from the Service in 1954, George moved to Shrewsbury where he lived up until his passing. He was a member of the Church of St. Anne. He went to work at the Raytheon Company while attending Fitchburg State College, where he earned his Bachelor’s Degree in Engineering. He worked at Raytheon for 43 years before he retired in 2002. While working there, he was instrumental in the final drafting and delivering of the Raytheon Radar Range, or, as we know it, the microwave oven! He traveled extensively for the company installing microwave antennas. 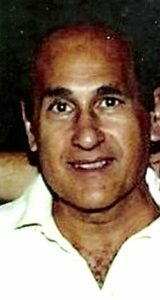 George was an avid skier and loved running, he participated in many 5K marathons. He had his pilot’s license and was a member of the Flight Club in Bedford. He enjoyed watching his New England Patriots on a Sunday afternoon with his feline friend, Rusty on his lap. He loved working on his house, his cars, and being with his family. He will be sadly missed by his family and friends. George’s funeral service and military honors will be held Tuesday, May 10, at 7 p.m., in the Mercadante Funeal Home & Chapel, 370 Plantation St., Worcester. Calling hours will be held from 4-7 p.m. Burial will be held privately. In lieu of flowers, contributions may be made to the Worcester Animal Rescue League, 139 Holden St., Worcester, MA 01606. To leave a message of condolence for George’s family or share a special memory, visit George’s memorial site at www.mercadantefuneral.com.